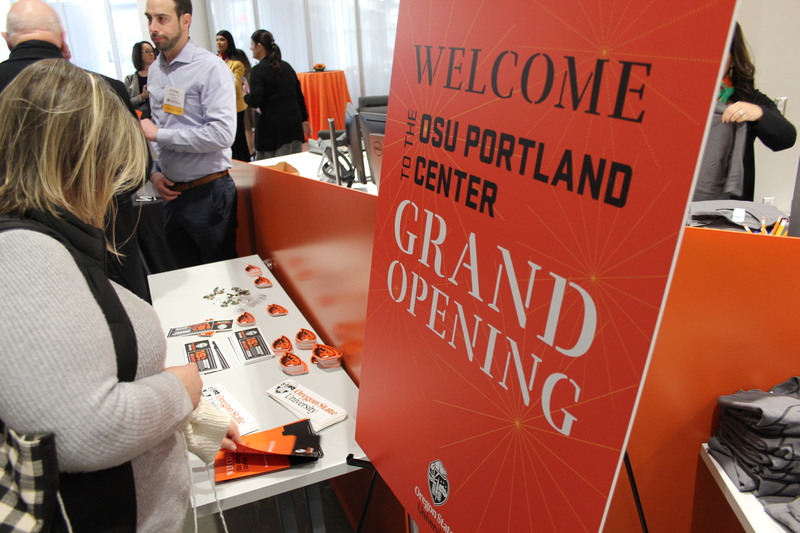 PORTLAND, Ore. – Hundreds of people attended an open house today to help celebrate the grand opening of the OSU Portland Center in the historic Meier & Frank Building in downtown Portland. 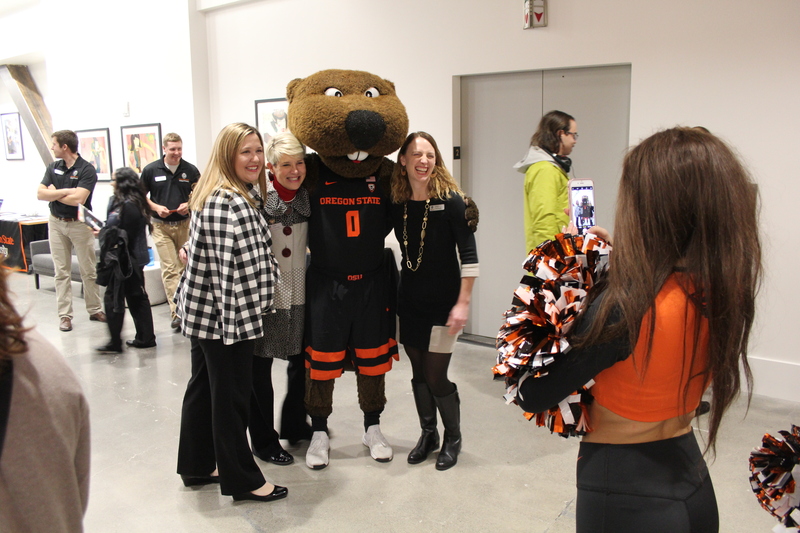 Visitors explored the center and talked to representatives from Oregon State colleges and divisions to learn about their programs, including admissions to OSU. In addition, OSU’s College of Business hosted three informative salon sessions on how businesses can leverage workforce trends and changes for success. In the hours before the open house, Benny Beaver and OSU cheerleaders handed out cookies to neighboring downtown business. 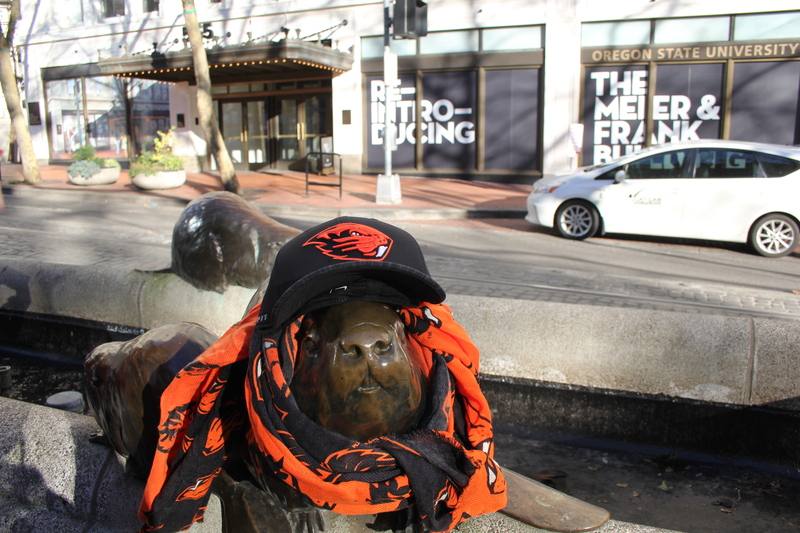 Additionally, Oregon State supporters dressed the bronze beaver statues located in front of the historic Pioneer Courthouse in OSU Beaver apparel. The Beavers are a permanent city of Portland park feature along Southwest Morrison Street, across the street from the OSU Portland Center. The OSU Portland Center is the home for expanded academic offerings in the Portland region and offices for OSU Extension Service, the OSU Foundation, the OSU Alumni Association, OSU Athletics and the OSU Advantage, the university’s private industry partnership and commercialization initiative. It also offers meeting space for OSU events. 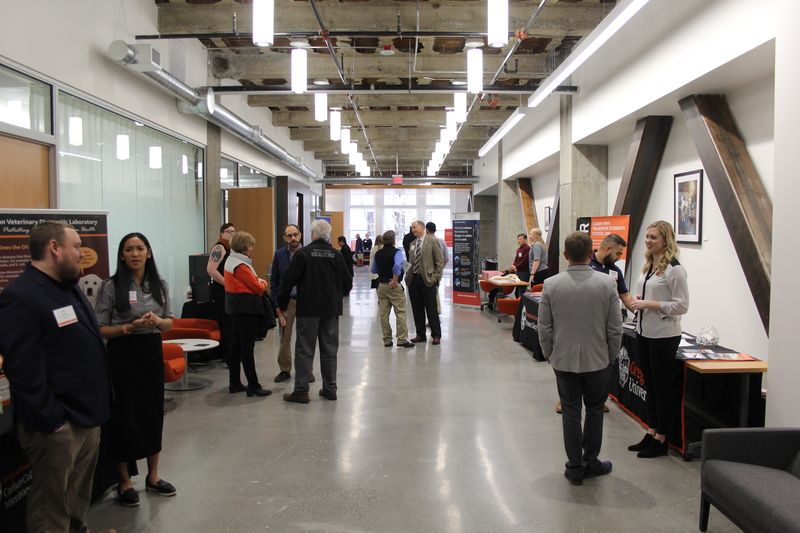 The university opened the nearly 40,000-square-foot second floor of the building in September to serve as a hub for Oregon State Portland-based operations. The historic 15-story Meier & Frank Building is located between Southwest Fifth and Southwest Sixth avenues, and Southwest Alder and Southwest Morrison streets. The Nines Hotel occupies the 6th through the 15th floors of the building. While OSU occupies the entire second floor, retail stores occupy the ground floor and additional tenants will be located in the 3rd through 5th floors. Tri-Met’s MAX light rail lines serve the facility on three sides of the Meier & Frank Building block.